This is neat: if you attended the Women's March a few weeks ago, you probably saw and felt the electrifying energy behind it. And whether you marched or not, some folks in Petworth are hoping to join others around the country catalyze that energy and figure out what to do next. On the Women's March website there's a list of 10 things you can do in the next 100 days, and one of them is a huddle, or a way to get together and talk about the next steps. I have started the "Action and Sanity" Huddle so we can practically explore thoughtful responses to emerging government policies/actions that affect us, our community, country and world. The goal of the Action and Sanity Huddle is to find common ground, support each other’s efforts and maintain our equilibrium. 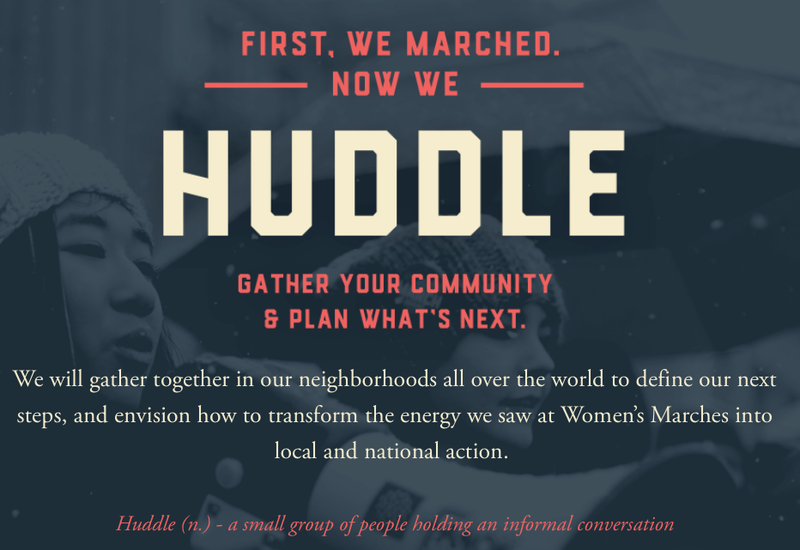 The Huddle will be positive, inclusive, and action-oriented. The focus is to share community organizing ideas, forge collaborations and inspire individual endeavors. What is a Huddle? Part of the first 100 days strategy through the Women's March this gathering of friends and neighbors will begin to transform the energy we saw at Women’s Marches into practical ongoing engagement. Over 4,000 Huddles are meeting in the USA and around the world.